Iowa resident Janine Brown’s life changes in an instant when she wins a dream home on the coast of Maine. The only trouble is that there are two Janine Browns living in Cedar Falls, Iowa, and both believe they’ve won the dream home. 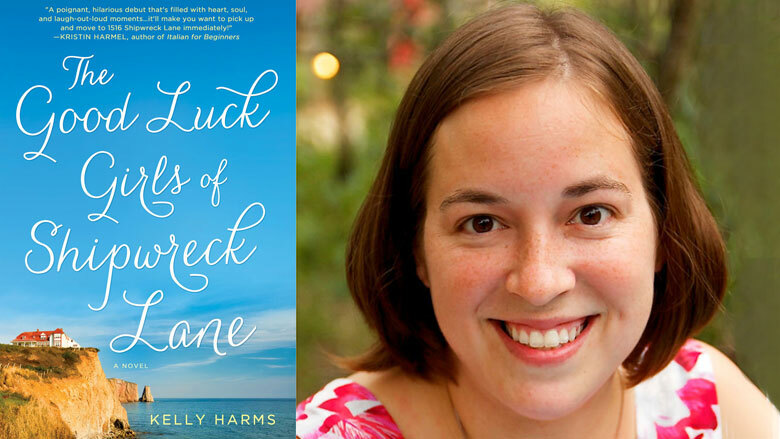 The two wildly different Janines come face-to-face in the Maine mansion, where they struggle for control of their future in Kelly Harms’ debut novel, The Good Luck Girls of Shipwreck Lane. The chapters alternate in perspective between the two Janines—one known as Janey and the other as Nean—who come to the home with different but similarly sad backgrounds. The loss of a loved one had sent mousy Janey into hiding. She cooks elaborate gourmet meals for herself and her Aunt Midge, and breaks out in hives at the smallest of social interactions. Winning the contest is the last thing Janey thinks she wants (Aunt Midge entered her name behind her back) and she considers giving it up to stay in Iowa and the comfort of her routine. It’s only at the insistence of Midge that Janey agrees to move to Maine. For Nean, the dream home is her ticket out of a hard luck life of homelessness and abusive relationships. Nean spends all her money on a one-way bus ticket to Maine and what she hopes will be a fresh start. Although she’s in her twenties, younger than Janey, Nean seems much younger still. She’s scrappy and clever, but also prone to impulsive behavior with the vulnerability of a teenager. Neither woman is delighted with the other at first, as both are convinced that the other is an imposter bent on taking what is rightfully hers. But a series of lies by Nean and the intervention of Aunt Midge, who sees the two Janines as just what the other needs, leads the three women to take up permanent residence together in the home. Of the three main characters, octogenarian Midge with her stories of love and adventure is the most colorful. Her embrace of life contrasts most starkly with Janey’s fear and introversion. Midge’s presence and snappy dialogue greatly enlivens those chapters belonging to Janey, which can otherwise bog down in her extreme social phobia. Her anxiety, and how death precipitated what we perceive to be a transformation in her personality, are only lightly explored. As a result, Janey appears to the reader just as she likely does to those who encounter her in life: flat, uptight, and closed off. Although fiercely protective of and loyal to Janey, Midge has far more in common with the hardscrabble Nean. Midge sees the vulnerability behind Nean’s wisecracks and opens the house to her over Janey’s objections. The two women form a fast bond as Nean attempts to take responsibility for her choices and life. Love interests for both Janey and Nean force each woman to confront her past and realize how much they need each other. The man in Janey’s life, Noah, is nearly as opaque as she is and it’s never clear what attracts him to Janey on their first meeting. Nean’s relationship, fitting her immaturity, seems more the stuff of a summer fling than a lasting bond. The Good Luck Girls of Shipwreck Lane follows a predictable path of discovery and redemption through friendship and love, but the charms and quirks of its characters—particularly Midge and Nean—propel the book along. Harms is an engaging and good-humored writer who delivers a light but enjoyably wacky story that will make every reader wish for an Aunt Midge of their own. Erika Janik is a freelance writer and the executive producer/editor of Wisconsin Life at Wisconsin Public Radio.